WALES is the 7th in a series of “Add On” countries that match my “Around the World Travels” packet, so you can collect additional countries for more travel options. This individual country is also available in a BUNDLE of 4 United Kingdom countries. Click the link for a big savings. Each “Add On” Country matches the same format of my jumbo “Around the World Travels Packet”, which includes generic templates that you can USE ALL YEAR LONG, plus “Christmas Around the World” options. Click on the link and check out the 20+ page PREVIEW for that jumbo packet, so you can see what these matching country packets will look like. Around The World Travels Packet. Each “Add On” country is at least 70-100 pages long. 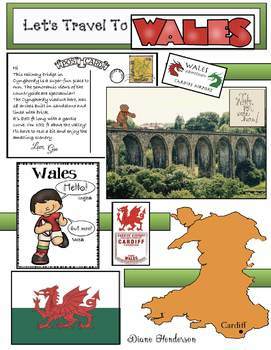 Because Wales includes a UK packet as well, it’s a whopping 108 pages long! Despite the fact that my 100+ page packets are $8-$10 dollars, all the individual countries in the “Around the World Travels” series will be just $6.95, to make collecting them more affordable. * Postcards from the gingerbread man with real photographs & postage stamps from that country. * 2 BW postcards so children can make their own to send. * “Snap & Scrap” pages. * Passport stamps for that country. (Passport in jumbo packet). * Suitcase stamps for that country. (Suitcase in jumbo packet). As with all of my products, everything comes in black & white + color, so that teachers can easily make samples to share. I’m Diane from Teach With Me, wishing you happy travels as you circle the globe, right in the comfort of your classroom. Click the link to see my "Christmas Around the World" ORNAMENTS! Don’t forget that all my new products are 40% off for 48 hours. Click the green star button to follow my shop & you’ll be notified of these huge savings.